EduPristine>Blog>You are Invited to the BIGGEST EVENT for Doctors in India! You are Invited to the BIGGEST EVENT for Doctors in India! Here is an invitation for you to join us for a FREE Seminar on USMLE- United States Medical Licensing Examination (USMLE)® organized by EduPristine. This is a GRAND event that is going to be conducted for MBBS students & professional doctors and graduates by a US based Doctor himself. Thinking of going to the USA after your MBBS/MD/MS? Considering sitting the USMLE® and scoring well? Or simply curious about how you could go about attaining an US residency position? Not anymore, now, know the WHAT, WHY and HOW of USMLE course by the STAR Faculty of USA Dr. Daugherty – First time in India. You’ll get valuable study tips, residency application information, exam insights and content review to help you score high and advance your medical career. This is a GRAND event conducted exclusively for DOCTORS in India who wish to practice medicine in the USA. Pursuing your MBBS, or already a MBBS graduate and thinking to attain US residency. If you are already planning to give the USMLE examination and want to clear all your doubts regarding USMLE. 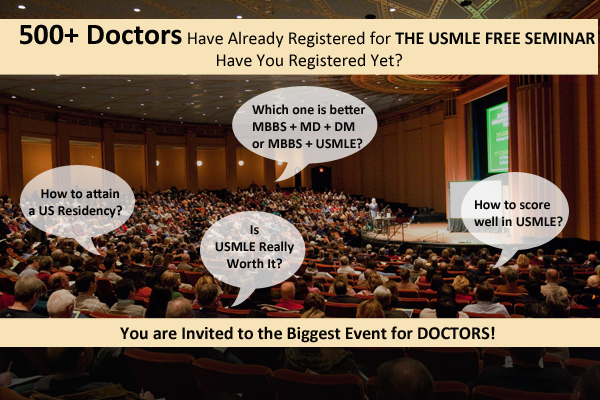 Why You Should Attend USMLE Seminar? Ask the Expert: This seminar is an ideal opportunity for you to get intensive exposure to a wide range of knowledge about USMLE. Networking Opportunities: Meet people sharing the same area of interests as you. Get a chance to debate issues related to the field, share experiences and exchange perspectives. Enjoy the professional connections even after the seminar is over. Renewed Motivation: Away from the daily grind of work and studies, attend this seminar filled with knowledge and excitement only to walk away with renewed motivation to pursue your goals and find your enthusiasm rekindled. This can lead to higher productivity and fulfillment of professional and academic goals. About the STAR Faculty- Dr. Daugherty: Each year he provides counseling and guidance to hundreds of doctors and medical students seeking to organize their study more effectively and excel on USMLE® exams. He is the author of over 70 published papers and numerous book chapters and is Becker’s Director of Faculty and Curriculum. For the past 26 years he has worked preparing students to pass the USMLE. Overall, the lack of doctors affects more than 1,600 geographic areas in the United States. Nearly 16,000 doctors would be needed to alleviate this shortage. The US has a growing need for physicians as the country’s population continues to grow and age. This demand has created an attractive job market for physicians that draws candidates from around the globe. United States Medical Licensing Examination (USMLE) is a three-step exam for medical licensure in the United States and is sponsored by the Federation of State Medical Boards (FSMB) and the National Board of Medical Examiners (NBME). USMLE assesses a physician’s ability to apply knowledge, concepts and principles. To demonstrate fundamental patient-centered skills, which are important in health and diseases, USMLE helps the medical students. USMLE constitute the basis of safe and effective patient care also.